As I'm sitting here working on a set of Airfix Australians I'm wondering why they went and wasted a pose on that daft bloke holding his rifle his rifle by the muzzle and swinging it around like a club. Most Airfix sets had at least one goofy pose that otherwise took up space for valuable sensible combat types. 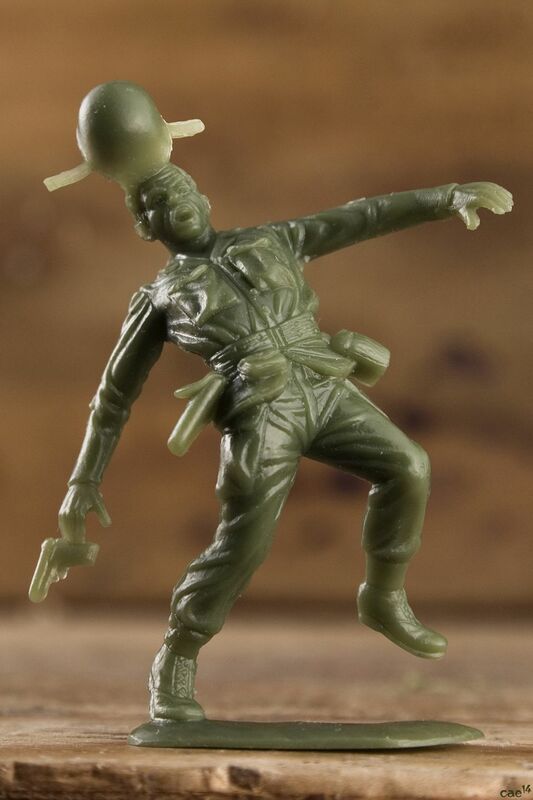 Ignoring "fluff" like wounded and surrendering figures, what do you consider to be the silliest pose in an Airfix set? That's definitely a silly pose. But for all its lapses in this area, Airfix were punters next to Marx. Some of those old Marx figures made us laugh out loud! I was annoyed that Aifix sets wasted plastic on "diorama" figures--casualties & stretcher bearers, wounded men & those falling who'd just been shot--but the most irksome to me was the dude holding his rifle over his head in both hands as if wading through water; this pose was included in several sets. The Afrika korps bayonet figure with rifle over his head. Priceless. Yes, we now how prone to storms and flooding North Africa is don't we? Even as a kid, I hated that rifle over head guy. I never had any use for him. My favorite was the commander with pistol. He was always the hero. He was more representative of the Indiana Jones adventurer type and was the most practical for me. Maybe he didn't have the most fire power but he was always the last man standing regardless if the adversary was a Ty Rex or a convoy of German invaders. Also, I think that the guy swinging rifle is a US cultural thing to channel Davey Crockett at the Alamo. I agree with Patrick(I assume it 3rd from the left). Exactly what is he doing? You may be aware that Strelets usually include a Streltsi figure in each set regardless of the period. I agree with Patrick (I assume it 3rd from the left). Exactly what is he doing? He's taking something out of the supply container also included in the set – link top row right. Still an odd position to assume, though. The ACW guy who looked like he was trying to bayonet his own foot. I remember hanging on and hanging on for Airfix to redo the British Paras using the figures in the 1/32 set … alas they never did . The American with the bren gun looking machine gun that was never issued, and also the guy with the M-16 over his head. Maybe the Para has discovered the resupply of condoms and is explaining what he's going to do with them……. The two guys carrying the loop of barbed wire in the WW1 British set were pretty dumb. Please, someone explain to me the german infantry with both hands to his face and his elbows out. Almost looked like an artilleryman covering his ears, but his hands are in front of his head. Nashville, that guy slipping on ice is useful for winter scenarios. But I'm not sure it's an Airfix figure? last figure on the right. Since I had a gazillion ACW figures back when I was a kid, I'd have to say it's the shaggy bearded guy awkwardly pointing his musket down toward the ground (4th from right in this photo). What is he doing anyhow?